So I am a little skeptical about part of this prank. But if they actually did accomplish this- it is pretty rad. So basically, these dudes poured Coke, presumably from 2-litter bottles into a swimming pool that holds 1,500 gallons of water. Then the Mentos and then ice… then the awesomeness starts! For all of you math nerds out there the ratio is for every 1 gallon they would need to use 3.785 litters of Coke. 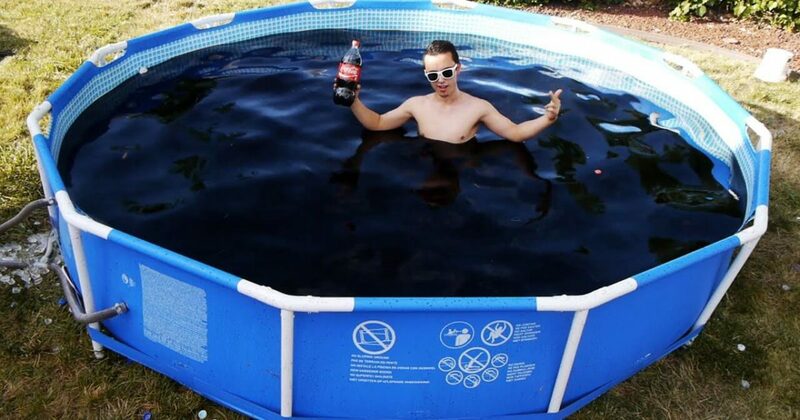 Or to fill up an entire small swimming 1,500 gallon swimming pool they would have needed 5,678 litters of Coke. So they would have had to spent over $2,839 dollars if the Coke was purchased for $1.00 per two-litter. Previous Alabama woman calls for a SNAKE. Yup, that just happened! Next What these kids are doing is giving them crazy injuries-- and the results are insane!